Tensions grew between Berlin and Tehran, which said it had arrested two German diplomats. 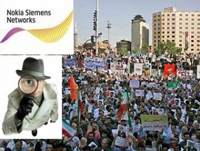 As a result German industrial giant Siemens announced this week it would stop signing new business deals in Iran from mid-2010. "The board has decided not to conclude new contracts with commercial partners in Iran," company spokesman Alexander Becker told reporters, adding that a decision had already been taken to this effect within the company last October. "There are clients that have offers on the table that expire by mid-2010 at the latest ... from this date onwards, there will be no new business," added the spokesman. The comments came as Tehran said it had seized two German diplomats for allegedly having a hand in anti-government protests last month. Germany is one of the world's leading exporters to Iran, although pressure to roll back dealings with the regime in Tehran has grown as the international community mulls sanctions over its disputed nuclear programme. Chancellor Angela Merkel said Tuesday that German-Iranian trade had "declined considerably" while acknowledging that the two countries had a "long tradition of economic cooperation." For her part, Merkel warned on Tuesday that time was running out before the international community considers sanctions, adding that February would be the "crucial month" in the UN Security Council. Sanctions on Iran would only work if applied "over the broadest possible basis," Merkel added, following talks with Israel's President Shimon Peres. Berlin has already reduced to a trickle the special export guarantees crucial to companies trading with Iran. In addition, according to press reports, the government is applying pressure on chambers of commerce not to organise seminars on Iran or business trips to the country.